love, laurie: a little date night! i mentioned yesterday that we have been super busy lately with rehearsals for different shows that are going on simultaneously right now. by some wonderful act of god, we both happened to have the night off from rehearsal yesterday. it was the first time that we have both been available at the same time in months, so we decided to make a little date night out of it. after work, we had dinner and then we went out to rita's for italian ice and custard. we came home, got in our pajamas, and watched a few of the shows that have been backing up on our dvr. it was so nice to relax and to spend some time together. I'm glad you were able to sneak in a little date night. Life is always busy, but making time for each other is so important! That looks good. 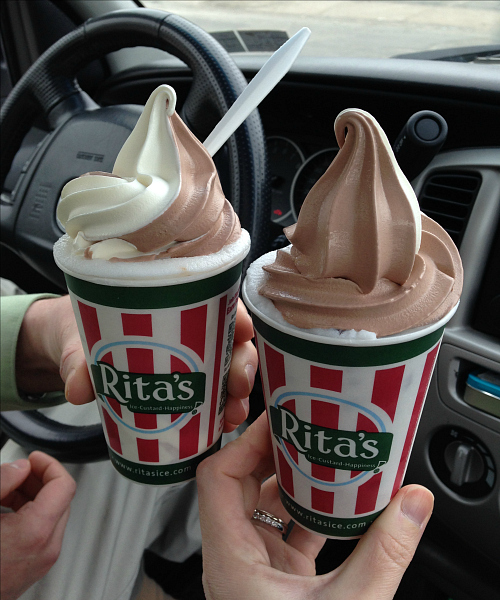 I have never had Rita's custard. Would I like it? I am looking forward to a date night with the couch. I seem to be getting home later and later. When dad is done with the taxes, then some Sunday I will make him take me for breakfast.